Anthony Abrahams lives and works in Gloucestershire, England. Having graduated from Cambridge with an Arts degree, he studied at the Anglo-French Art Centre in London. After a successful career in advertising he studied sculpture and soon developed his own distinctive language. Abrahams’ carefully poised, enigmatic figures follow a tradition in British sculpture that began in the 1950’s with sculptors such as Armitage, Butler, Chadwick, Frink and Meadows. The exaggeration of some features and the repression of others, unified by formal and textural qualities, give his sculpture a personal and expressive quality as if Prehistoric fertility symbols had been reborn in the contemporary world. 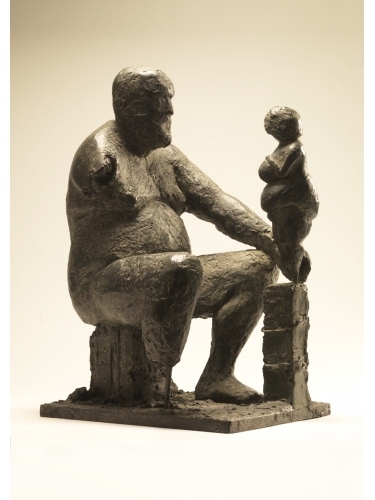 His emblematic figures, caught in playful postures, remind us of ourselves and of those familiar to us. Most recently, he has turned to an exploration of printing methods including solar prints, drypoint and monoprints. He handles this new medium with characteristic dexterity, producing images of great charisma and poignancy. Abrahams’ work is in private collections in the UK, USA and Europe. His most recent major piece, ‘Ozymandias, King of Kings’ can be seen at King’s Place, London. Click here to view other works by Anthony Abrahams.